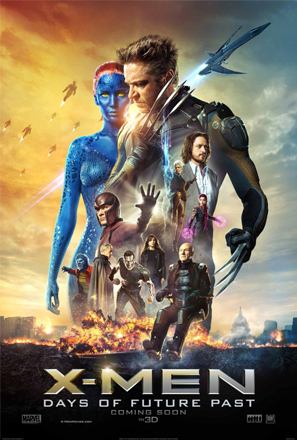 Currently sitting at the top of the box office, X- Men: Days of Future Past is directed by Bryan Singer and features a remarkable line up of Hollywood’s finest, including Hugh Jackman (Wolverine), James McAvoy and Patrick Steward (Charles Xavier/ Professor X), Michael Frassbender and Ian McKellen (Erik Lehnsterr/Magneto), Jeniffer Lawrence (Raven Darkhölme/ Mystique), Halle Berry (Ororo Munroe/ Storm), Nicholas Hoult and Kelsey Grammer (Hank McCoy / Beast) and many more. In X-men: Days of Future Past, mutants and humankind are on the brink of extinction due to the mass wipe-out of mutants by Sentinels, along with future parents who will give birth to children with the mutant X gene. Faced with absolute annihilation, the X-Men enlist the help of Kitty Pryde (Ellen Page)- a mutant who can project a person’s consciousness, allowing her to send them back in time to prevent the approval of Sentinel production by the Congress. Wolverine is sent back to 1973 in hopes of preventing Mystique, Charles’ former sweetheart, from assassinating Bolivar Trask (Peter Dinklage), the military scientist who had created the Sentinels- robots that can trace the mutant X gene and destroy their bearers- and triggered worldwide panic, ultimately winning the approval and mass production of Trask’s creations. Set on a seemingly impossible task, Wolverine has to persuade and band together sworn enemies Charles Xavier, who is in a phase of depression due to the loss of his students in the Vietnam War, and Erik Lehnsterr, the alleged murderer of President John F. Kennedy currently being held at a highly secure underground prison, to help him in his mission. With the familiar complex storyline based on the well-loved X-Men series by Marvel, this film packs a great adventure for both Marvel and non-Marvel fans, with a brilliant storyline and script accompanied by well-placed CGIs, a gist of humour every now and then, not to mention the drool worthy scenes of a shirtless Hugh Jackman to keep both male and female viewers glued to the screen. For those of you who are itching to go see this movie, be sure to remain seated till the end of the credits for a little surprise. Tags: action, action films, action movies, Days of future past, etc mag, ETC. Magazine, featured, films, movie review, Taylor's University, Taylor's University Lakeside Campus, TULC, x-men. Bookmark the permalink. Previous post ← Kitchen Retreat: Scrambled Eggs with Spanish Olives.